The media coverage of large scale disasters over the last decade has reinforced awareness of the important role community organizations play in the preparedness, response and recovery phases of a disaster. Images of residents performing search and rescue and mass feeding has jump started a national conversation about creating strategies to prepare residents and local organizations to assume disaster preparedness and response roles. The Empowered Communities Program’s Neighborhood HUB initiative supports neighborhoods as they create a local network, a HUB, of organizations that advances the community’s overall preparedness on a daily basis, as well as provides essential support to residents as they recover from a stressful event of any size. Every resident of San Francisco is supported by a nearby network of community serving organizations that are committed to advancing their disaster preparedness as well as offer a safety net of support after a stress event of any size. 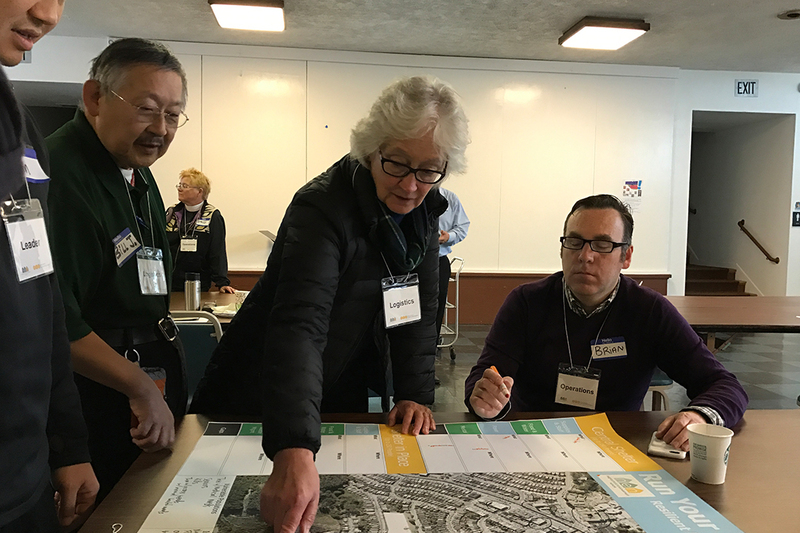 San Francisco’s Empowered Communities Program (ECP) provides communities with the technical support to assume rightful ownership of their resilience. By moving the community into a “recovery” state pre disaster, the ECP empowers neighborhoods to craft a culturally competent resilience action plans for the mitigation, preparedness, response and recovery phases of the disaster. At the core of this planning process is a cross sector cohort of neighborhood stakeholder organizations who guide their resilience investments and advocate for their program needs.During times of stress, this cohort leverages a decision making platform called an ECP Neighborhood HUB that uses the Incident Command System (ICS) to identify the needs of the community and respond in a culturally competent manner. The secret to a successful disaster response is to invest heavily before the event in preparedness at the individual, organizational and community levels. HUB member organizations by collectively managing their internal continuity of operations plans and conducting interagency drills. The HUB as an entity by convening on a regular basis and conducting table top exercises. 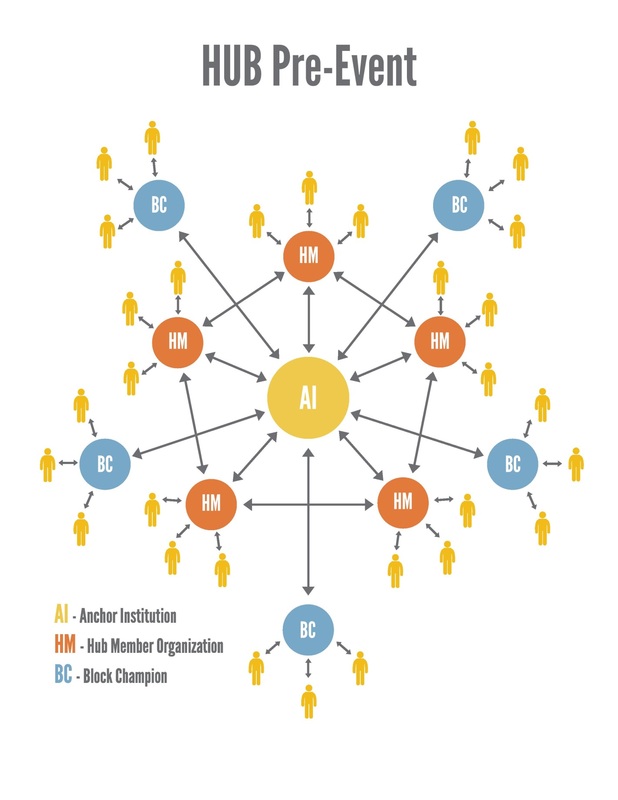 Anchor Institutions – This organization is the local driver of resilience work and has the organizational and political capacity to convene the surrounding organizations and keep them engaged in HUB activities in perpetuity. HUB Members – These organizations serve the community in a variety of capacities and are committed to meeting the HUB’s mission before, during and after a disaster. Block Champions – Individuals play a vital role in the community surrounding the HUB by advancing the level of preparedness and connection at the block level and coordinating with the HUB during times of stress in support of any residents who may be sheltering in place in their homes. The goal of a HUB workshop is to convene local stakeholder organizations, faith-based organizations, community leaders and residents to introduce them to the HUB Program. After this workshop, attendees should better understand their community’s needs post-disaster, recognize the value of teamwork in addressing those needs, and identify individual and collective investments to attain their internal and external disaster response goals. Four HUB workshops were held in October and November 2016. During times of stress, the HUB activates its Neighborhood Emergency Operations Center (NEOC) and convenes HUB members to assess the situation that is confronting their community and design and implement solutions using the core operating procedures of the Incident Command System (ICS). NEOC – Similar to the Emergency Operations Center that the City uses to manages events, the Neighborhood Emergency Operations Center (NEOC) offers key stakeholders a decision making platform and framework. Support Partner – These organizations will house, or provide offsite, mission critical services to the community called out in the plan generated by the NEOC. 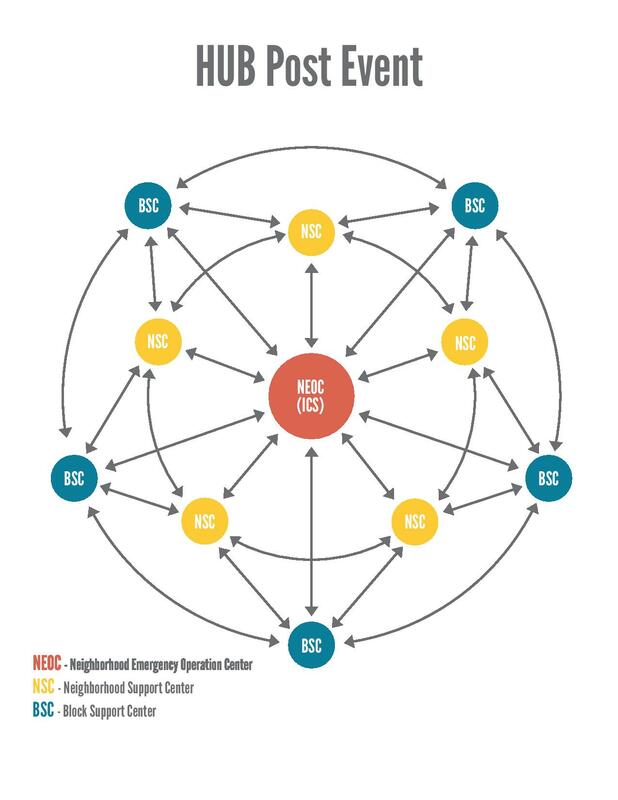 Block Support Centers (BSC) – The Block Champions will activate CCCs to provide the NEOC with situation awareness, coordinate support to vulnerable residents sheltering in place and general information to the immediate community.